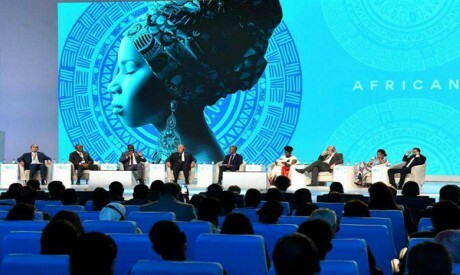 “Africa is a youthful continent and we need to facilitate the creation of jobs to help the young achieve their ambitions in development and empowerment,” said Foreign Minister Sameh Shoukri in his address before the “Agenda 2063: the Africa We Want” session at this week’s World Youth Forum. The African Union’s 2063 Agenda is a strategic framework for the socio-economic transformation of the continent over the next 50 years. During the session Shoukri underlined the importance of Agenda 2063 in enabling African youth formulate sustainable development plans. “During next year’s Egyptian presidency of the African Union we look forward to intensifying efforts with our partners in Africa to implement the pillars of Agenda 2063,” said Shoukri. Evelwny Butoyi, Burundi’s minister of youth and information technologies, noted that Africa was once the venue for wars and conflicts whereas the focus now is on maintaining peace and security. “We need to promote a sense of belonging and responsibility among the young and a greater awareness of the challenges they will face,” she said. Butoyi called on governments to exert every effort to promote modern technology and ensure it can be accessed by inhabitants of rural and remote areas. Arnauld Alandj, the delegate from Gabon, underlined the importance of providing increased opportunities for young people, especially in the early years of education. He said that in Gabon companies are legally required to reserve 30 per cent of jobs for young people and 30 per cent for women. Gunter Nooke, German Chancellor Angela Merkel’s representative for Africa, said Germany is fully committed to partnership with Africa in achieving the goals of Agenda 2063 and ensuring that youth and women receive the professional training they need. He added that Africa and Europe were development partners and the two continents had to cooperate in facing important challenges like ending illegal migration. The Chairman of Afreximbank Benedict Okey Oramah also described Africa as the “young continent” and pointed to the fact that 68 per cent of the African population are youth. The representative of Chad focused on the importance of enhancing the role played by women and of encouraging more women to take up leadership roles. “We know the strength of African women. If Agenda 2063 wants to be a reality — not mere talk — we must give priority to African women. We need to focus on issues that affect your sister, your daughter and your mum,” she said. She called for greater investment in women’s education and work training. President Abdel-Fattah Al-Sisi, who was in the audience for the session, said the call for such funding would be among the recommendations of the 2018 World Youth Forum. “Here in Egypt we have a special appreciation for women; they constitute 50 per cent of the community and we are keen to integrate them within Egyptian society,” said Al-Sisi. “In the past the Church of Alexandria played an important role in spreading Orthodoxy in Africa. Al-Azhar also played an important role in spreading Islam in the continent,” he said. He reviewed Egypt’s support for liberation movements in various African states in the past as well as its expanding role in Africa under President Al-Sisi. He said Egypt’s chairmanship of the AU in 2019 was a crowning of the country’s historic role in the continent and expected Egypt to work hard in resolving conflicts in South Sudan and the Greater Lakes region, to take part in preventive diplomacy and to play an effective role in implementing Agenda 2063.